I am often asked, “What should I feed my puppy? What do you recommend?” I have always researched the dog food and looked at the first few ingredients, as I was told that these were the most important and meat should always be the first one. The guaranteed analysis was the next important criteria. We had been feeding NutriSource Dog Food but then we were introduced to Life’s Abundance Dog Food and the amazing nutrition it provides. We were so impressed by the quality and high standards of this dog food and the amazing testimonials from the customers and field representatives of this company that we decided to switch to Life’s Abundance Nutritional System and Agility Formula. Our mission at Oregon Mist Goldens is to improve the quality of the English Cream Golden Retriever Breed and offer our customers beautiful, healthy, and sweet-tempered puppies that they can enjoy for years to come. This line of pet products was formulated by Dr. Jane Bicks, DVM. 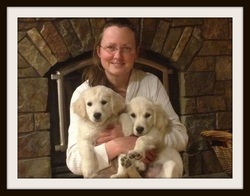 She has been a holistic vet for over 20 years. She has served as President of the American Veterinarian Association of New York City, earned three Presidential Citations, appointed by Mayor Rudolph Guliano to help establish one of the largest animal shelters in the world, the author of three books on responsible care and treatment of pets, and has appeared on 48 Hours, Good Morning America, CNN, Discovery Channel, Animal Planet, and more. She has also created a non-profit foundation where a percent of her product line is contributed toward rescue and care for pets. We are now feedings our dogs Life’s Abundance Nutritional System and Agility Formula and raising the puppies on this food and supplements to help ensure a long and healthy life, as well as provide our puppies a healthy start. Oregon Mist Goldens believes SO strongly in Life’s Abundance Dog Food & Supplements, that we offer a Lifetime Free Replacement Puppy on all of our Golden Retriever Puppies that are kept on Life’s Abundance Nutritional System & Agility Formula when they don’t reach their life expectancy of 10 years (life expectancy for Golden Retrievers 10-12 years). Click here for more details.